Governor Jay Inslee Proclaims July 14th, 2016 as Summer Learning Day! 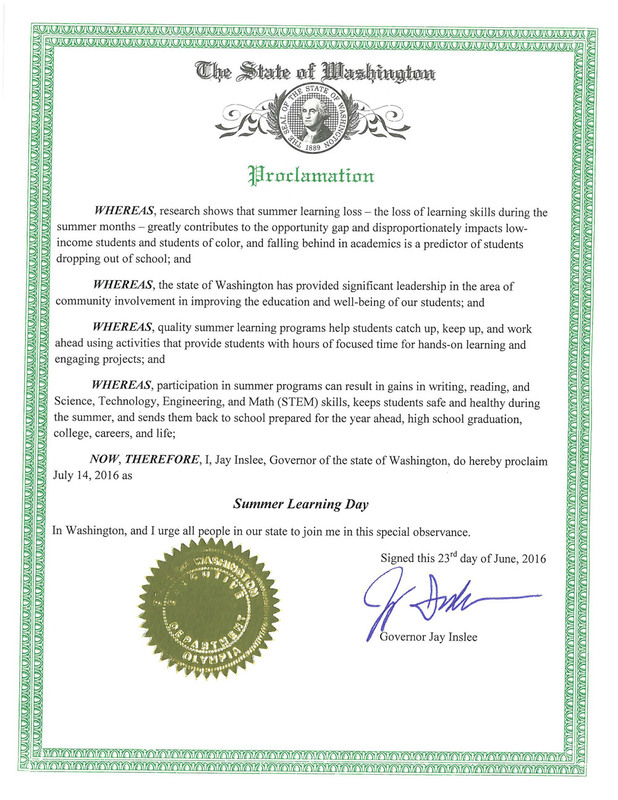 Washington State Governor Jay Inslee has proclaimed July 14th, 2016 as Summer Learning Day across Washington State. This is the second time Governor Inslee has lent his support to this celebration of high quality summer programming, highlighting the need for engaging and fun programs across Washington State that are accessible to all of Washington’s children and youth. According to poll conducted by America After 3pm, only 21% of school-age children in Washington State participate in summer learning programs. This is despite the fact that 49% of parents polled would enroll their children in one, if a program were available to them – an indication of the considerable unmet demand for summer learning programs in the state. Summer learning programs can help close the opportunity gap that has been attributed, at least in part, to cumulative learning loss during the summers and that has been shown to be steeper for low-income youth and youth of color than for others. By highlighting quality summer programs across our state and nation, policymakers can see for themselves the impact summer learning can have. First Lady Michelle Obama joined the National Summer Learning Association earlier this year in promoting July 14th as National Summer Learning Day, and School’s Out Washington is thrilled that Governor Inslee has chosen to highlight the critical importance of summer learning in Washington as well. Help us show policymakers, parents, and the public how summer programs prevent the summer slide and give kids the opportunity to have lasting learning moments that ignite passions! Visit our Summer Learning Day webpage for tips and tools on how to host your own Summer Learning Day event and be part of the movement to give all children and youth the opportunity to benefit from summer all year round!